The Odd Company | Why Us? With TDP as a platform we have developed an integrated methodology to support organizations deliver a comprehensive strategy to drive and deliver team effectiveness. A corporate team strategy (CTS) is essential if the correct approach and support for teams is to be in place. Anything less will substantially inhibit the potential of teamwork in the organization. Teams are the most important production unit of organizational life. Teams come in all shapes and sizes. They are created and disbanded with a high degree of regularity and frequently change in terms of objectives and composition. However, the vast majority of organizations do not have a corporate team strategy (CTS) and the approach to team development for many is ad hoc. Teams are taken as a given and expected to perform. When a team struggles, the organization might intervene with a team initiative and, more often than not, this is one-off in nature. It is not an intervention embedded in a strategy that has been designed to deliver the most appropriate team skills and behaviours for that organization. In many cases the nature of team intervention for can be different across an organization with no connection between the initiatives being deployed. A corporate team strategy (CTS) is essential if the correct approach and support for teams is to be in place. Anything less will substantially lessen the potential of teamwork in the organization. Because our approach to Team Effectiveness is unique we are in fact complimentary to other team assessment providers. 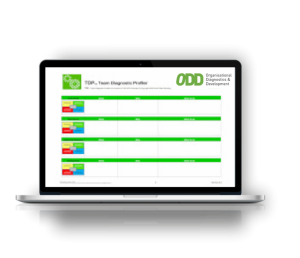 TDP integrates easily with your existing Business and HR metrics covering such areas as Performance Management, Financial Performance, Internal Team Benchmarking, Staff Attrition, Absenteeism and Leadership Profiling. And thanks to its modular design TDP seamlessly integrates with your existing HR and Business processes.